A nice healthy Father’s Day meal that we really enjoyed. Quickstep liked it, too. Baby Lady: What would you like for dinner. It’s Father’s Day. Me: I dunno. I haven’t figured out what I want to cook. I’ll figure it out in a minute and we can go to the store. Baby Lady: But it’s Father’s Day. You’re not supposed to cook on Father’s Day. Me: But it’s Father’s Day and I’m supposed to do what I like and wanna do on Father’s Day and I wanna cook something I like. Baby Lady: Let me take you out to dinner. We’ll go to Suze or Paisano’s or anywhere you like. You’ve been talking about trying out Dean Fearing’s restaurant. Let’s go there. Me: But I wanna cook. I have a dish I wanna try. Baby Lady: You never let me do anything for you on Father’s Day. She even tempted me with tomatillo glazed baby back ribs. But no. Hrrmph! Somedays I lose and she cooks me something but it’s Father’s Day which means I’m supposed get to do what I like. That means I get to cook. I really like to cook and she knows it. So, generally, she gives in and I get to play in the kitchen. Tonight we got to try something I’ve been wanting to do. 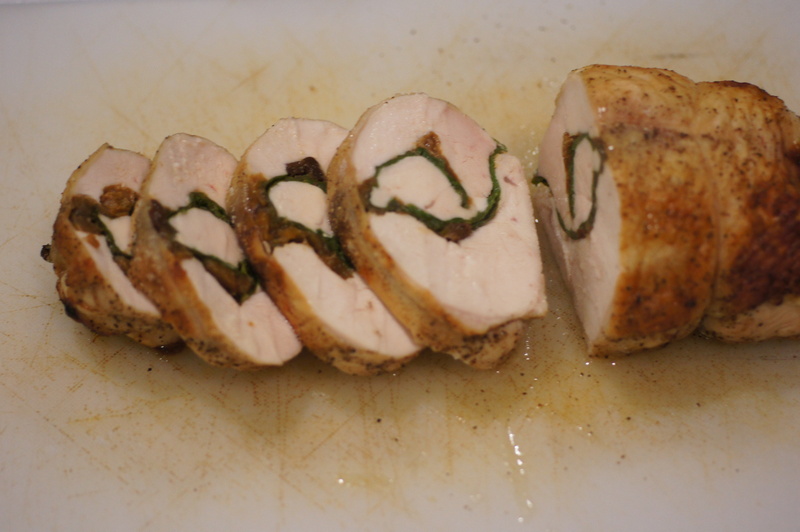 I’ve been wanting to make a chicken roulade for a while. I also knew what I was going to pair with the chicken. 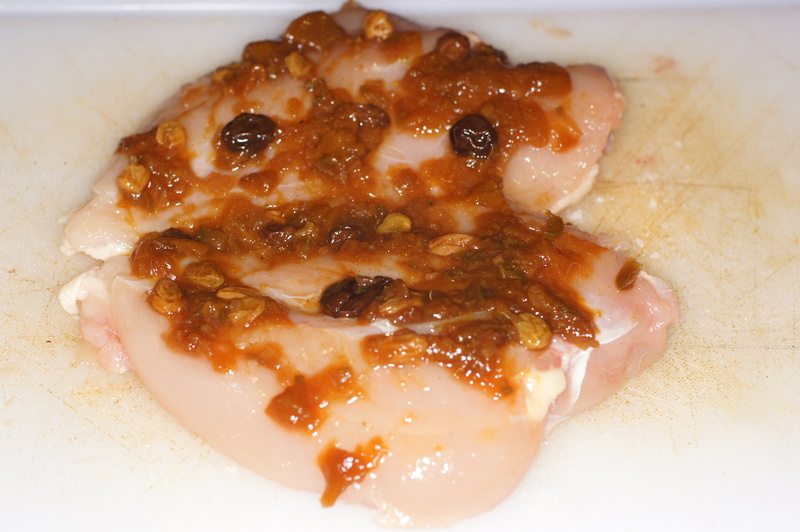 I have this fabulous peach chutney (recipe here) that goes well with chicken, among other things. I also have a garden full of fresh, young arugula. 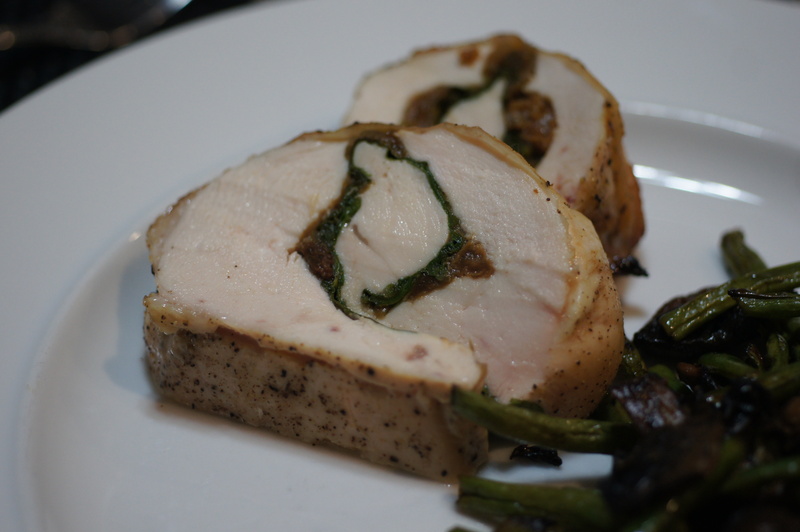 I felt the sweet tanginess of the chutney would pair well with the peppery bitterness of the arugula and the mildness of the chicken. It did. This was a beautiful meal with a lot of flavor, a real show stopper, well worth the time and effort. I hope you give it a try. The hardest part about this meal is the chicken breast. 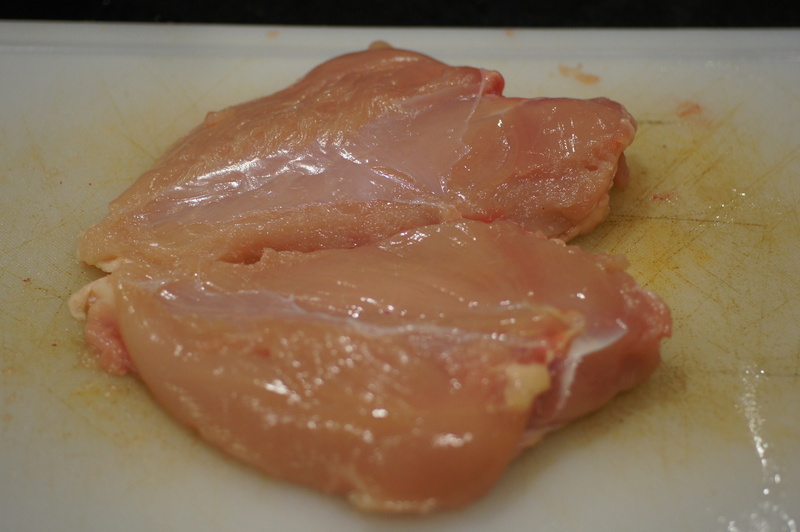 I have a difficult time finding boned full breast of chicken (some people call them double breast) with the skin on. I can always find boneless, skinless breast but I like the skin left on. It helps keep the breast meat moist. I also like the crispy skin as part of the texture of the meal. 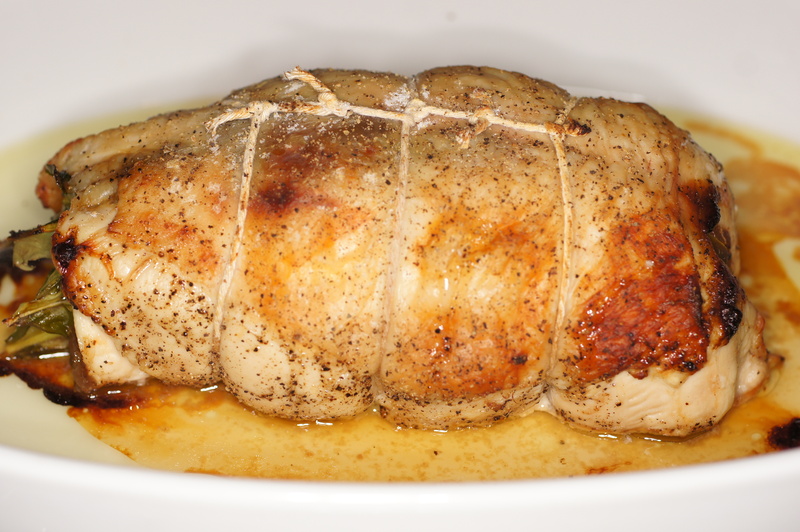 If you can find a boneless full breast with the skin on, this meal is a snap. If not, you will need to butcher the chicken, which really isn’t that hard. 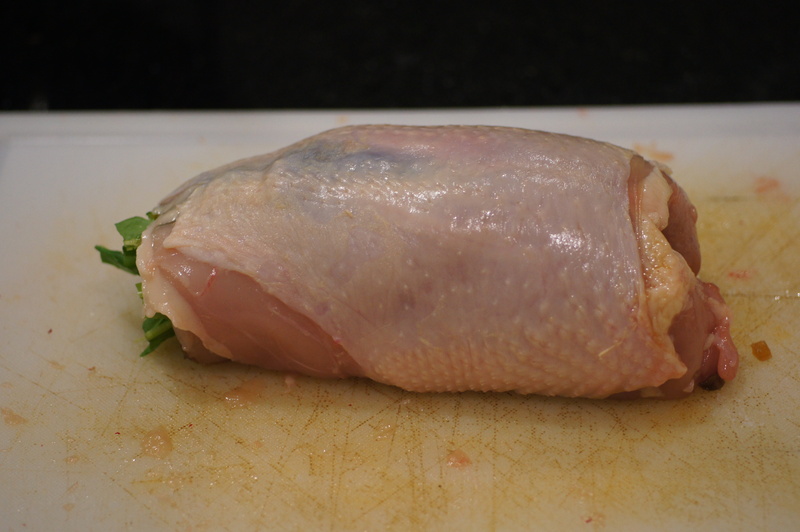 To butcher the chicken, first, cut the skin next to the breast where the thighs and drumstick are located. Next find the hop joint. You can do this by Flexing the thigh toward the back which will dislocate the hip. Now, take the point of your knife and find the hip joint. Stab the point of the knife into the joint and twist. You will fell the hint “pop.” Firmly slice downward through the joint and skin parallel to the back. Then slice the thigh meat away from the back. Repeat process on the oppose side. Now grab one of the wings. Similarly, twist it back to dislocate the joint. Insert your knife point into the joint and twist, then slice downward through the flesh and skin. Repeat the process on the other side. Get some kitchen shears and following the breast, cut through the rib bones and shoulder bones attached to the back to free the back. Cut away the wish bone. With a little practice, you can butcher a whole chicken in 2 minutes. Another 3-5 minutes and you will have the chicken breast whole, skin on, and deboned. Otherwise, your butcher will do this for you. I just like to play with my food. After you have boned the chicken breast, season the meat with 1/2 tsp salt. Slather 3 Tbsp peach chutney on the meat. 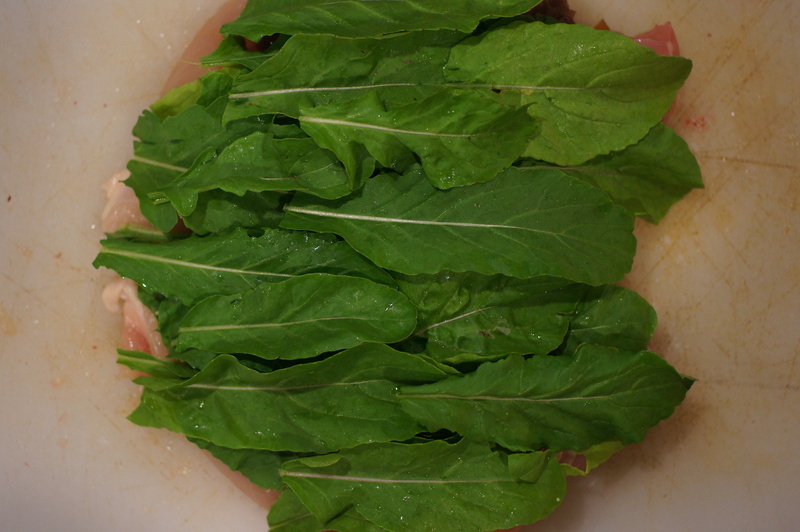 Now add 2 cups of arugula (or enough to generously cover the breast 1/2 inch thick). Now grab one of the sides and roll the breast pressing firmly and making sure the ingredients stay in the chicken as you roll it. This sounds harder than it is. 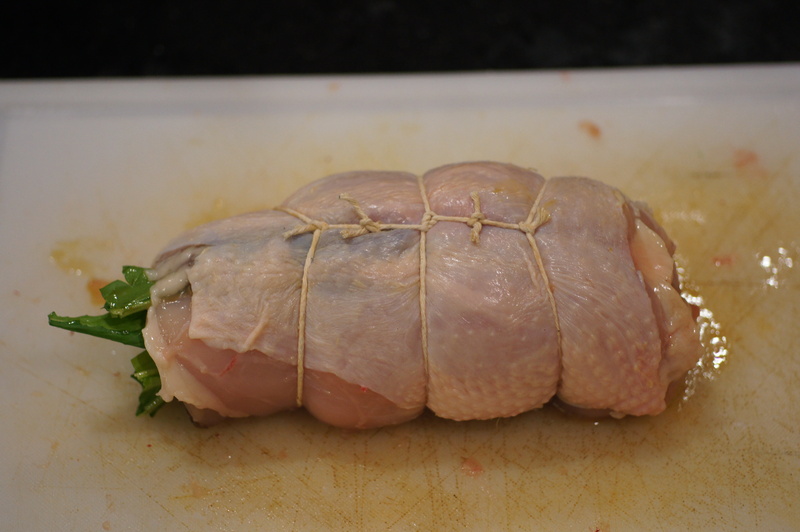 Now, slip some cooking twine under the bottom toward the end (roughly 1-1/2 inch to 2 inches from the end), come around the sides and tie off over the top, like you would do a roast pork. Repeat the process 2 more times, once in the middle and then the other end. Take the lose ends and this them together. This ensures the roll will not fall apart and will cook evenly. Place in a greased roasting pan. Put in an oven preheated to 350 F and roast for 35 minutes, or until done. Let rest for 5 minutes. Remove twine and slice into 1 inch thick slices. Thanks for dropping by and your nice comment. The flavors were delicious.